Discussion in '2019 NBA Draft' started by Normalus, Mar 2, 2018. Feel free to post your own, this is for @sinceday1 . I have only one guy. In September he was listed as #6 in one of the draft mocks & was a lock for the first round in every other, but then awful season start happened (more like awful shooting %'s happened), and then season ending injury happened. And he fell completely out of the draft mocks, even 2nd round doesn't have his name anywhere. He has a 7-foot-3 wingspan and the strength and speed to guard all five positions at the college level. Jackson can switch screens and protect the rim on defense, and he can step out and knock down 3s (43.8 percent on 3.2 attempts per game, the season before this year) and create shots for his teammates on offense. He has all the tools to be a special player & he is built a lot like Kawhi. Williamson, bulkatron, Koperboy and 3 others like this. Might not get drafted but Omari Spellman in our system could be a major sleeper and a nice rookie backup for Ryno. roslolian, jamisonrocket and Williamson like this. Some random names... not fully researched, so add thoughts if you have any! Williamson, D-rock, HTown_TMac and 1 other person like this. LOL maybe but he's 6'10 (w/shoes) and long. Also more athletic than Ryno but doesn't the range that Ryno does, no one does. He's a more athletic Mo Speights who people were begging we pick up on a buyout. Agree on Bonga, check my thread. Watching Spellmen with this dem verts. I would definitely want to invest in him. Has he express his thoughts in declaring for NBA draft or not yet? Spellman and DiVincenzo both are in draft but without agents. Morey loves white guys and I can see him angling for the Delaware Jordan. Can we look into a sleeper forward ? The biggest weakness Spellman has in his drive to be great. Don't know that it's there. He should've been a better rebounder. The tools are there. His body, especially those tree trunk hips, reminds me of Paul Millsap. Has the tools and talent. Needs to push himself into even better shape and to play better defensively with more effort. Jontay Porter- 6’11 still growing stretch 5 with shot blocking and a high basketball iq. Went to Mizzou instead of his senior season in high school. Best passing big man in the draft. don grahamleone, varughese.arun and D-rock like this. Don't know if I'd call Anfernee Simons a sleeper. But he is flying under the radar right now. Anfernee is one of those guys that could be superstar or bust. Has great potential on both sides of the ball. Cat-like quickness just leaves defenders grasping at air. Good length for a point. But rail thin. Which is ok for me if a guy has the quicks. And he definitely does. Has a very quick release on his jumper. Scouts are saying he has a low release. He doesn't. He simply pulls up and gets it off before the defender can react. Definitely has NBA long distance range. Great finisher as well. Use his quicks to get to the rim. All nice there. And has good defensive potential with his feet. What he doesn't have is a complete game. He doesn't quite know how to break a defender down that is bumping on him and taking away his space. And he doesn't know what to do when the defense keeps switching on him and running him on the dribble. His handle, while good, isn't great. His vision, at this point is questionable. He doesn't do a good job of sizing up the defense and simply making the right play. Is it youth, inexperience, and lack of maturation? Or is it selfishness? I can't tell that. Don't have any info presently. Does anybody have info on his attitude, character, and work ethic? Those are the keys to his development. His skills issues can be solved and solved relatively early if he's got the mindset right. And if he does he's a superstar. If he doesn't he could turn into a chucker that either busts or possibly becomes a Jamal Crawford type shooter. If I were a lottery team with no young superstar and no chance of making the playoffs next season and not able to attract free agents like the Sixers a few years back......I'd be tempted to draft him and hand him the basketball in a baptism by fire development. But only.....only if his attitude and work ethic boxes are checked good. 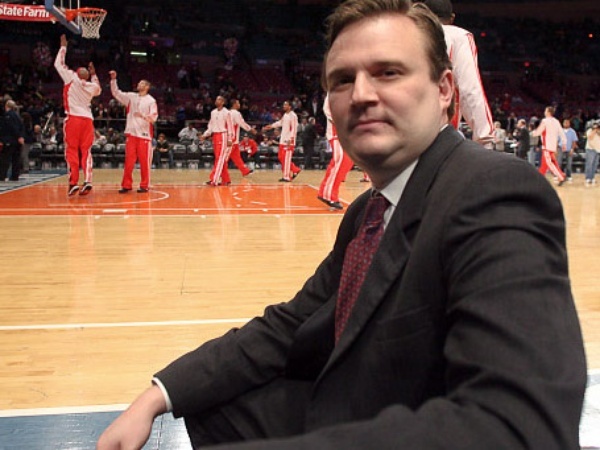 If Morey can get Bonga, I'd be elated. He might not be totally there yet, but that FT% says that there is quite the base for improvement. I'd love for the Rockets to get their hand on Eli Okobo. PG/SG on French team Pau Orthez. Great young shooter with a good first step. Wyoming's Hayden Dalton. You heard it here first. Who will be the sleeper / overlooked player in this draft?